June 26, 2016 – In a fast paced 4 Goal match this Sunday Goose Green defeated West Shore/Red Maple winning 9-3. 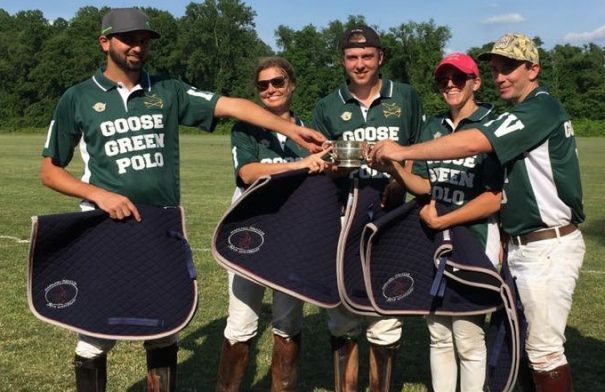 On a beautiful afternoon at Maryland Polo Club both teams played flawlessly, but Goose Green held a steady edge as the chukkars progressed. Goose Green was represented by Nate Berube, Jake Brown, Liv Stringer, Laura Brown, and young Will Green. West Shore/Red Maple was comprised of PJ Orthwein, Sara Orthwein, Max Hempt, and youth player Maddie Grant. Offensively consistent player, Jake Brown, received the MVP award. PJ Orthwein’s 4th chukkar horse, Dixie, was voted “Best Playing Pony”.